Now stop imagining, because within 5 to 10 years that is how a digital Earth will operate. Always-on relationships will embed a private, invisible 2-way channel inside of products and services. Each task and step will include new people-first automated conversations that replace searching, customer support, shopping, and e-commerce services like Amazon. New abilities to produce universal customer success will produce connected products that make their users as good as the best in the world. The companies that master this new connected consumption will multiply their revenues and profits, and grow to lead the economy. Connected user experiences will be tomorrow’s marketing. A company’s brand will be the always-on journey it delivers—the kind of customer experiences (CX) it weaves into its connected products and services. A digital Earth evolves beyond the disconnected physical world of atoms we have today. It adds connected consumption that moves bits at the speed of light, bringing everyone together inside every activity. Imagine that you have a short list of trusted vendors, and they know your personal consumption patterns. When do you use each product? Where do you use it? How much do you use? Your few trusted vendors know and supply you continuously and accurately. You receive the right products and services at the right times and places. With two-way interactions during use, your vendors also know the quality level you want, and they learn the improvements you need during use. Because connected products deliver real-time active knowledge, they respond to your steps and problems during use so it has become normal to succeed quickly, every time. Best of all, you have a digital kill switch so you can switch to a different vendor in a nanosecond. This makes your vendors focus on your needs, with total dedication to making you happy. Connected consumption works great for you. Your trusted vendors work hard to serve you personally and well. Connected consumption brings every part of a business into personal real-time relationships with customers: who is each customer? When and where do they use each product and service? How many do they use, and to do what? How do they want them delivered? Connected needs research includes the users. Design tests with real users doing their real tasks. Supply chains turn immediate and responsive. Manufacturing produces mostly what is consumed, without needing to make excess inventory. Distribution is direct to each customer, minimizing inventories in distribution centers. Local logistics responds flexibly to customers’ daily lives. Visible: Both the customers and supply chain will be visible from customer needs to suppliers, distributors, and local deliveries. Each area’s metrics, results, and gaps will be visible. Communicating: Powerful new communications will find and fix problems right away. They will integrate operations in each area, as well as across the entire connected consumption plus supply chain business system. Collaborative: Different areas will work together continuously to respond to changes and apply resilient solutions to problems. Responsive: Unmet needs are learned from customers’ gaps during use. New designs and features will be tested by real customers during real uses. Flexible: Efficiency is increased in all areas simultaneously, whether the issues are in supply (materials and manufacturing), distribution, or new consumer needs. New real-time big data will use analytics and models to react to changes as customers evolve. “What if” scenarios will use predictive analytics to create plans for many kinds of events to apply immediately when needed. Responsive companies will provide their customers with the right products, services, and deliveries. Today’s silos will be replaced by integrated ecosystems. Marketing’s role changes as much as the business when customer interactions spread to every touchpoint in the connected consumption life cycle, with constantly great customer experiences required. Your company’s business goals are now tied to the success and satisfaction of every customer, which must be delivered during every product use and interaction. Marketing will lead this new shared customer experience (CX) theme throughout the company. 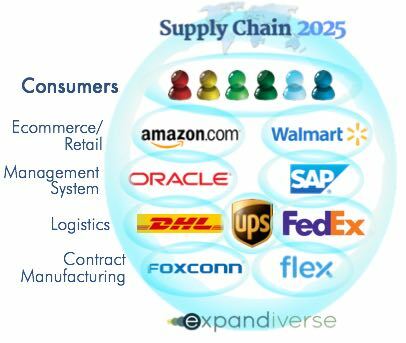 Connected consumption will be the key force driving business strategies, product plans, designs, supply chain forecasting and management, distribution, delivery, and every user interaction during the use of products and services. These operations will each stay connected with customers and with each other. Marketing will become the common theme of a digital Earth company—how the company advances and improves every customer personally, at every touchpoint. Connected consumption marketing will soon have a new business goal: maximize the quality of every customer’s experiences so they want only your products and other vendors aren’t even visible on their screens. Once it is clear connected consumption is coming and will eventually dominate, it’s possible to start planning the new marketing stack and business processes that will lead tomorrow’s digital economy. Learn customer goals, thinking, and journeys. Turn the high-value touchpoints into a requirements and design spec. Research and know the customer journeys that comprise 80% or more of your business’s revenues and growth. Select high value customer journeys, steps, and user experiences. 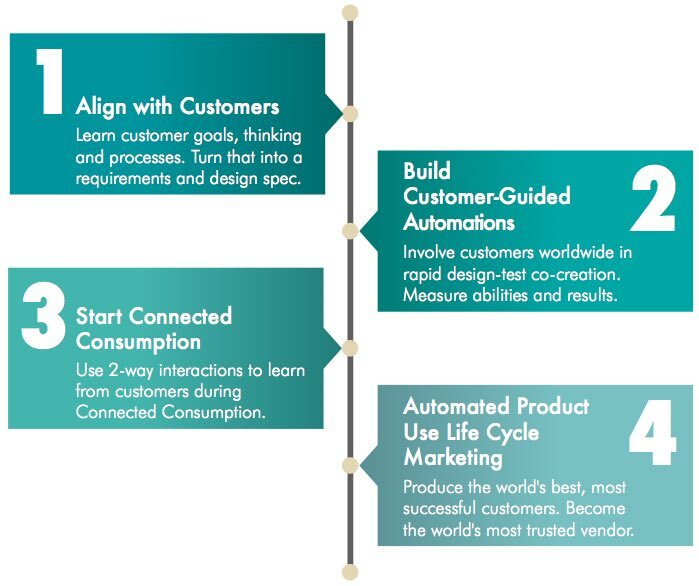 Involve customers worldwide in rapid design-test co-creation. Start delivering selected real-time marketing automations that accelerate and expand customer success in a growing number of customer journeys, starting with these key steps and touchpoints. Develop and run 1 or 2 customer journeys that include “automated customer success” at every touchpoint. Expand from customers to business operations: use connected consumption data as guidance for supply chain, distribution, and logistics. Start a real-time dashboard: display user problems and improvements in real-time. Continuously raise these metrics until high levels of immediate customer success are systematic. Deliver this using a leading cloud service (Amazon, Microsoft, Google, Oracle, SAP, etc.) so that your platform can be scaled worldwide for you and sold to other companies as a service. Expand and integrate multiple products, infrastructure vendors, and business processes into this connected consumption platform. Become one of the world’s best, most used, and most followed platforms. Evolve from brand style guides to user experience platform guides, marketing’s next stage. Orchestrate user experiences that develop a connected consumption platform into the best journey to quality living for both people and companies. To lead a people-first digital Earth, you and your company can be the first mover that leads connected consumption. Many companies can be sold and guided in adding connected consumption to their customer-vendor relationships. Thousands of companies can be brought on board by enlisting consulting firms like Deloitte, Accenture, and PwC. Consultants can systematically integrate connected consumption into a firm’s existing business processes and include change management to adopt this thinking. Giant tech platforms like Amazon can be surpassed by large numbers of companies who use connected consumption to develop their own customer-vendor relationships. A new digital Earth economy will support large numbers of successful companies instead of one giant Amazon that makes a huge sucking sound as it defeats more companies. A digital Earth is inevitable, and connected consumption will be part of it. Every digital step will grow into a connected user experience that includes real-time triggers. The world’s best knowledge, tools, and commercial choices will be retrieved and embedded, making personal success the norm. Everyone can rise. Trustworthy companies will empower people, enjoy connected consumption in return, and lead a people-first digital economy. They will manage their supply chains for accuracy, efficiency, lower prices, and higher quality. Their businesses will gain lower sales costs, minimized advertising, decreased risk, and increased profitability and customer satisfaction. Customers will enjoy private and personal journeys to quality lives. Connected consumption will deliver products and services accurately based on when and where each person needs them. These connections will also add universal personal success. 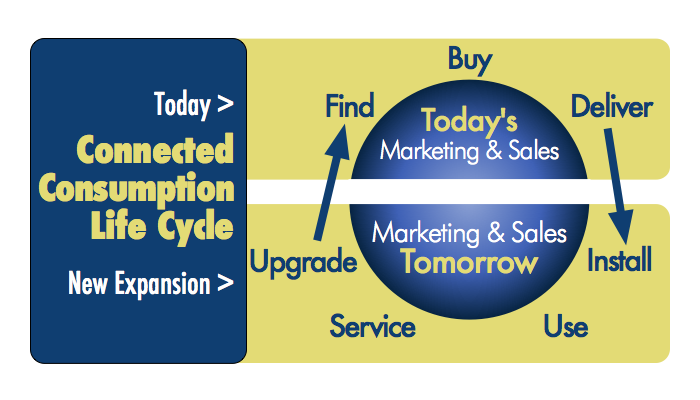 Marketing’s biggest priority will be to turn the life cycle stages of “install, use, service, and upgrade” into connected consumption that both secures markets and blocks competitors. 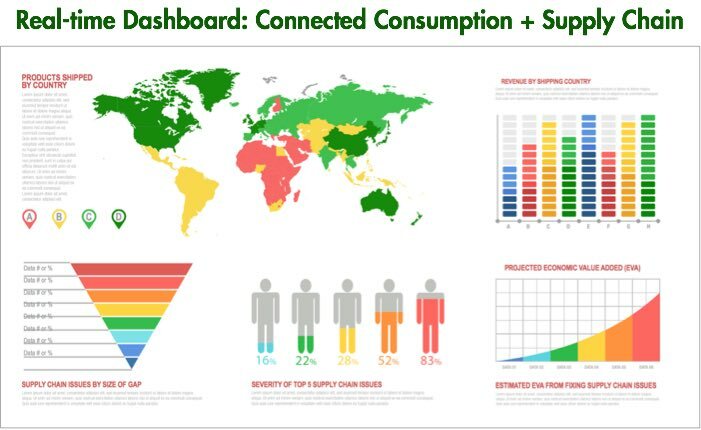 As connected consumption spreads to most products and services it will transform how well we live every minute. These great experiences will win and hold customers. The ability to multiply revenues and profits will be more powerful than ever before. People and trusted companies will share the high-quality world they have always wanted, for the first time in history. Connected consumption is how you and your company can rise to the top and lead your industry. Then scale to lead the digital Economy with a people-first digital Earth.